The cover of this book is intriguing at first glance. It is a photo of President Lyndon Johnson in a White House elevator with President-Elect Richard Nixon on November 11, 1968, just days after Nixon won the Presidential election by the 2nd closest margin in the 20th century; the first being John Kennedy’s victory over Nixon in the 1960 election. There is almost an irony to that alone. 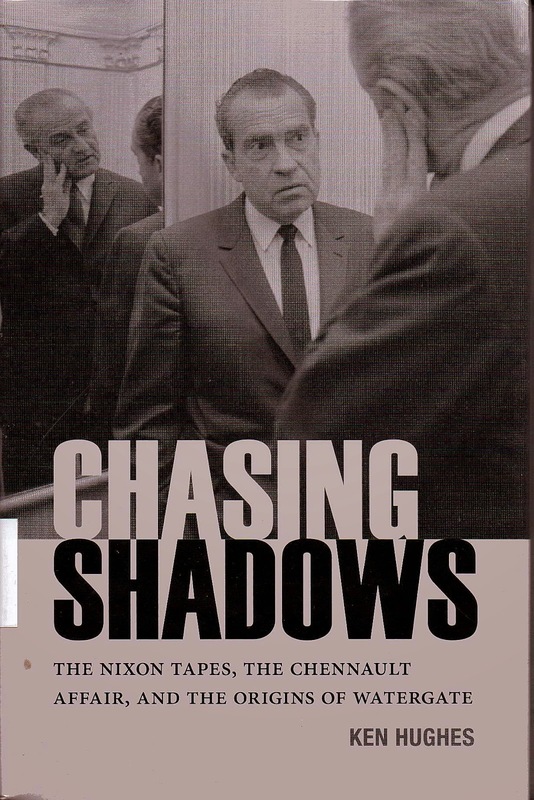 The author mainly concerns himself with tying the Watergate Affair to the 1968 Presidential election, when Nixon basically sabotaged the Paris Peace Talks; talks which would have possibly cost him the election against Vice President Humphrey. Through back channel maneuvers with Anna Chennault; widow of the man who commanded the Flying Tigers during World War Two; Nixon was able to accomplish just that, narrowly winning the election in the bargain. That was in 1968; in 1972 he would win by a landslide. The real surprise here is the role Lyndon Johnson played in defeating his own Vice President, whose aims and goals regarding Vietnam did not match the party position in reference to the bombing halt. Johnson wanted it pegged to the restoration of the DMZ; with which the Republicans agreed; while Humphrey and McCarthy wanted to stop the bombing without conditions in order to show “good faith” to the North Vietnamese. Relying on thousands of hours of tape recordings at the Johnson Library and the Nixon Archives, the author paints an accurate picture of the political ambitions which got us into the war in the first place, and then kept us there far longer than was necessary. There were no “clean hands” in the bunch. The Republicans and Democrats were both focused on politics rather than what was right. These tapes prove the point. While Johnson was advising Nixon; and Nixon was working with Chennault to delay the Peace Talks; an atmosphere of secrecy and subterfuge became the standard operating procedure in Washington. That attitude led directly to Nixon forming the celebrated “Plumbers Unit” in the White House; ostensibly to stop “leaks.” Left to their own devices they went on to embroil Nixon in the Watergate scandal; something he knew nothing about until after it happened. This was Nixon’s Bay of Pigs. He was blindsided by the same group of people in the same way in which Kennedy’s administration was blindsided by the last minute revelation of the full extent of the Bay of Pigs Invasion. This is a very important book in that it finally ties the Watergate scandal to the things which preceded it. There are many who believe that Nixon was set up by the CIA and Howard Hunt; who were working with some Cuban exiles that were connected to the Bay of Pigs fiasco. The real question is why? Nixon was asking for the CIA files on the Bay of Pigs and even stuff related to Dallas from the moment he took office. Why? He was surrounded by people who all had ties to George Bush; either as an oil tycoon, or later as a politician and head of the CIA. Why? This book doesn't answer these questions, but they are inherently connected. The author has touched only the tip of the proverbial iceberg. The name Bush doesn't even appear in the index. The author even blames the entire ineffectiveness of the B-52 bombing of the Ho Chi Minh trail on Pentagon and Cabinet leaks while completely ignoring the Walker Spy Ring, which cost the U.S. approximately 15-20,000 more battle deaths. It is impossible to discuss the B-52 bombing raids, and their having been compromised, without at least mentioning the Walkers. But that is exactly what the author does. This book is a very detailed and helpful account of the proposed policy to halt the bombing in Vietnam and how it was used as a campaign issue by both sides in the 1968 election. It even shows how Nixon forged a policy of secrecy and paranoia which would eventually culminate in the Watergate burglary and his eventual departure from the White House. In spite of any shortcomings, this book is still an important one, if only because it goes beyond the basic assumptions of Watergate being the product of an overzealous staff and a paranoid President. Nothing as complicated as Watergate could possibly be that simple.